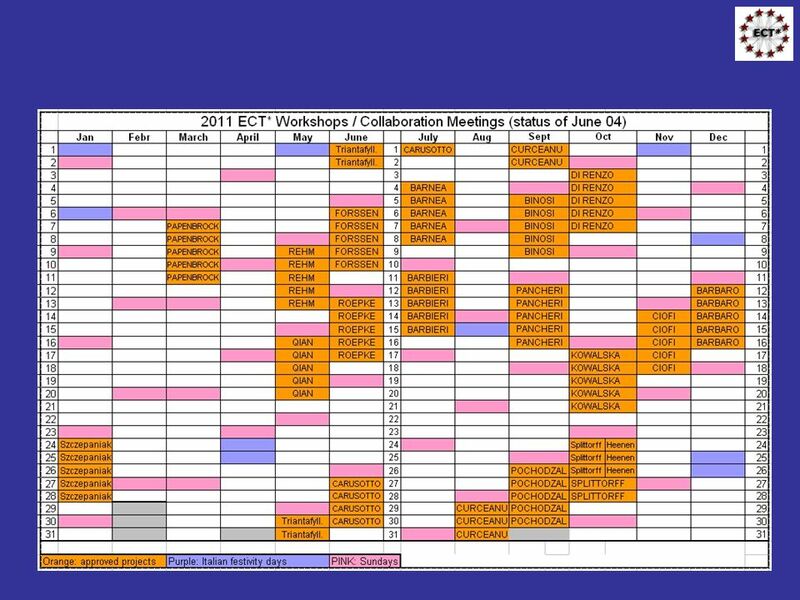 NuPECC Meeting June 17 – 18, 2011 Prague Achim Richter, ECT* and TUD Directors Report www.ect.it. 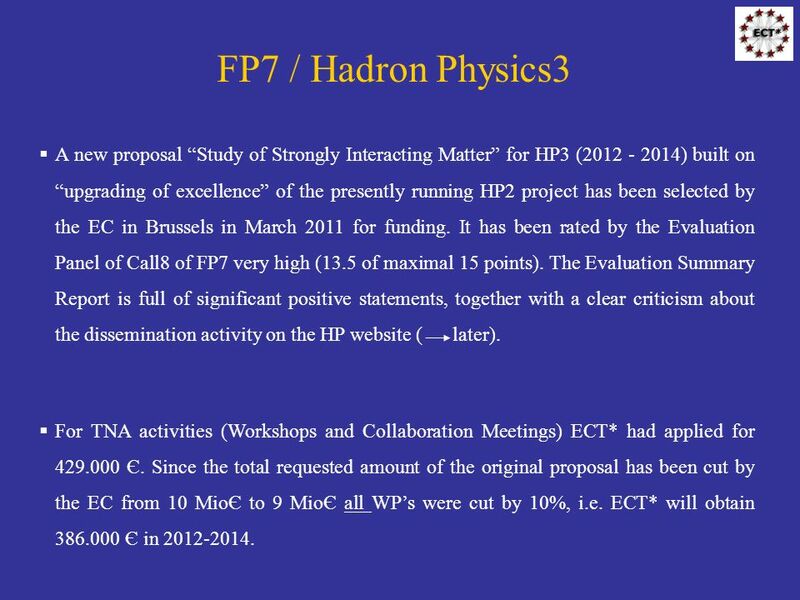 13 FP7 / Hadron Physics3 A new proposal Study of Strongly Interacting Matter for HP3 (2012 - 2014) built on upgrading of excellence of the presently running HP2 project has been selected by the EC in Brussels in March 2011 for funding. 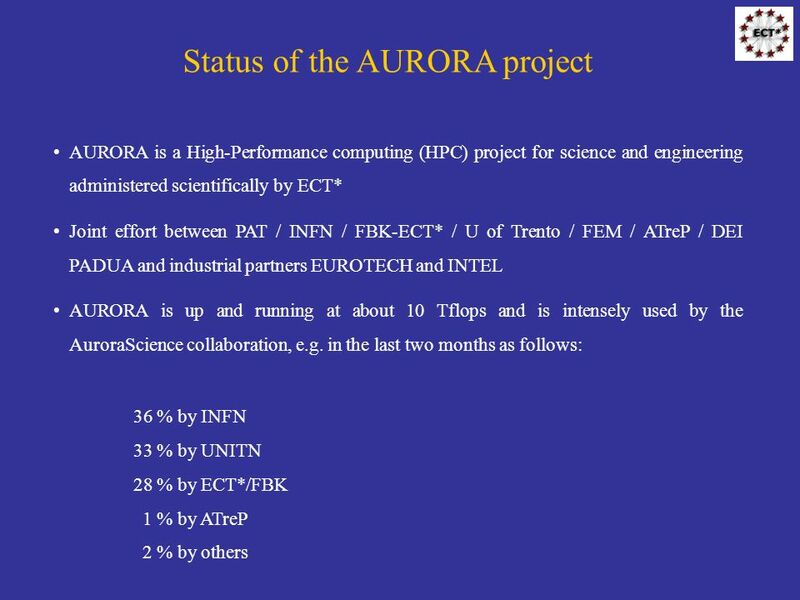 It has been rated by the Evaluation Panel of Call8 of FP7 very high (13.5 of maximal 15 points). The Evaluation Summary Report is full of significant positive statements, together with a clear criticism about the dissemination activity on the HP website ( later). For TNA activities (Workshops and Collaboration Meetings) ECT* had applied for 429.000 Є. 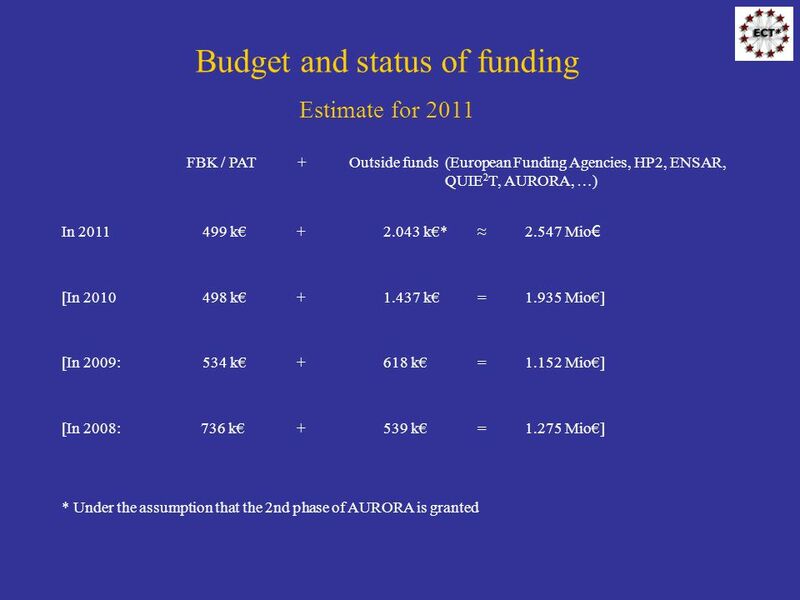 Since the total requested amount of the original proposal has been cut by the EC from 10 MioЄ to 9 MioЄ all WPs were cut by 10%, i.e. 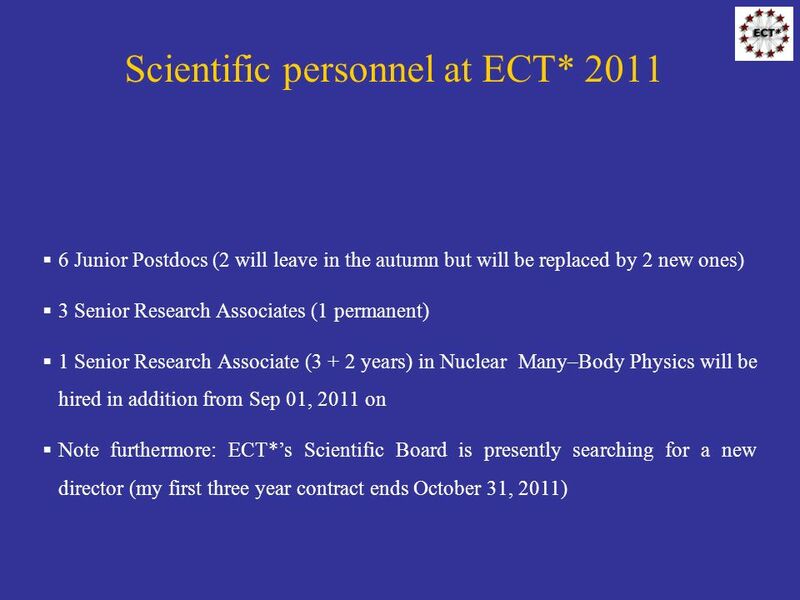 ECT* will obtain 386.000 Є in 2012-2014. 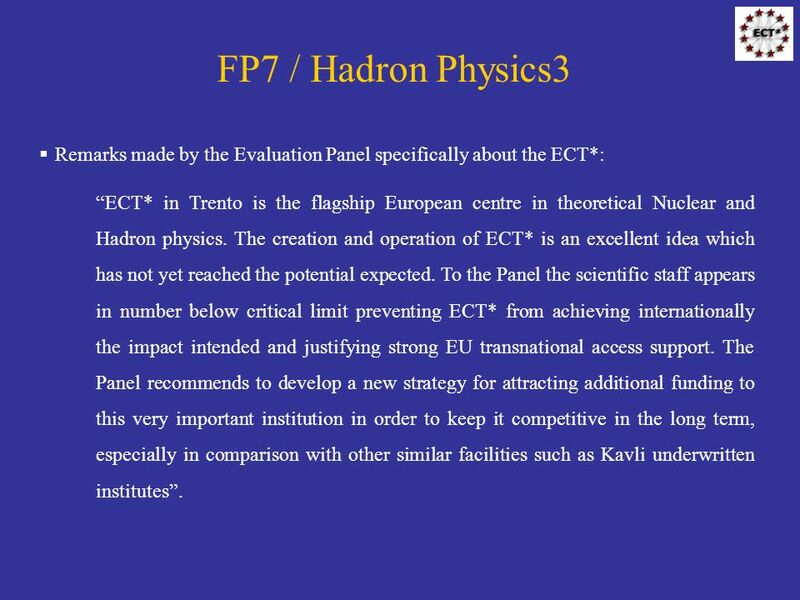 14 FP7 / Hadron Physics3 Remarks made by the Evaluation Panel specifically about the ECT*: ECT* in Trento is the flagship European centre in theoretical Nuclear and Hadron physics. 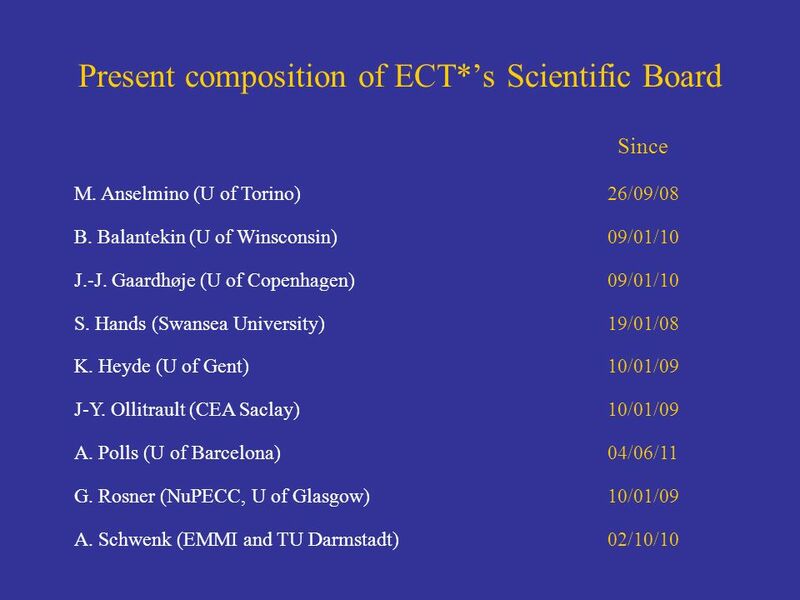 The creation and operation of ECT* is an excellent idea which has not yet reached the potential expected. 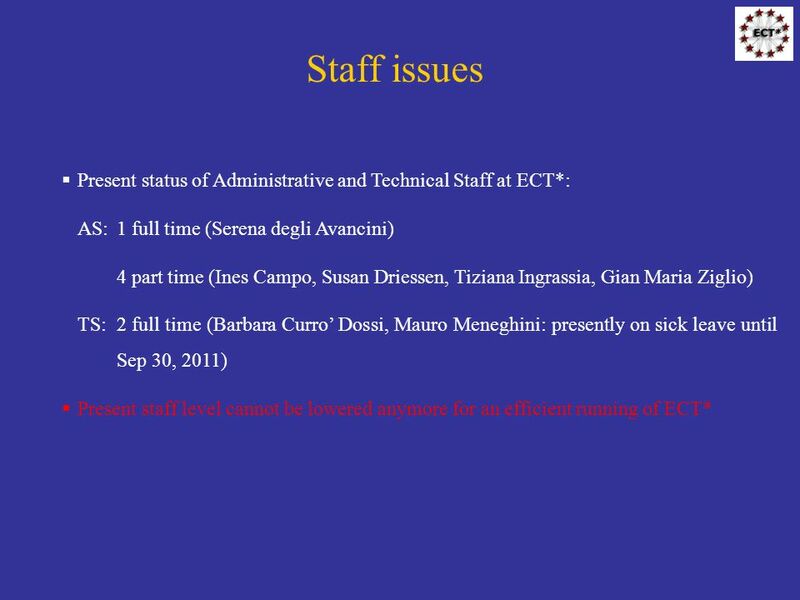 To the Panel the scientific staff appears in number below critical limit preventing ECT* from achieving internationally the impact intended and justifying strong EU transnational access support. 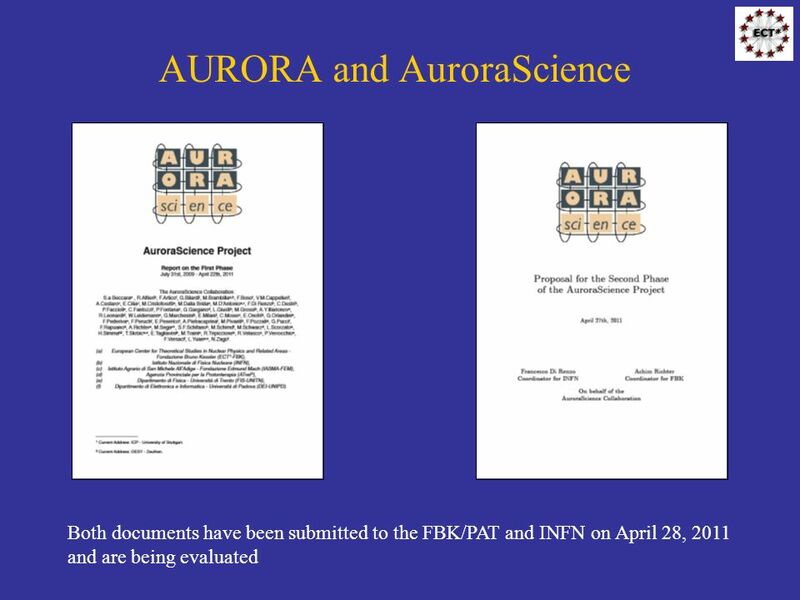 The Panel recommends to develop a new strategy for attracting additional funding to this very important institution in order to keep it competitive in the long term, especially in comparison with other similar facilities such as Kavli underwritten institutes. 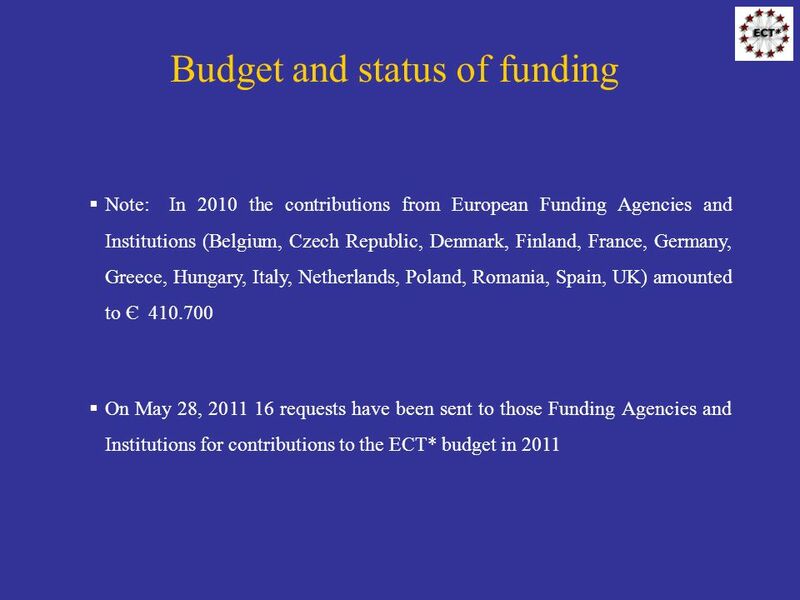 Download ppt "NuPECC Meeting June 17 – 18, 2011 Prague Achim Richter, ECT* and TUD Directors Report www.ect.it." CO-REACH Social Science Research Presentation on CO-REACH pilot call for ILN Meeting Brussels 24 September 2009 Anouk Tso Royal Netherlands Academy of. Summer Workshops Erasmus for beginners Pam Morris. Extreme Light Infrastructure (ELI) 4 Pillars (2009): I. CZECH REPUBLIC: Secondary Sources 10PW II. HUNGARY: Short Pulses 10PW III. 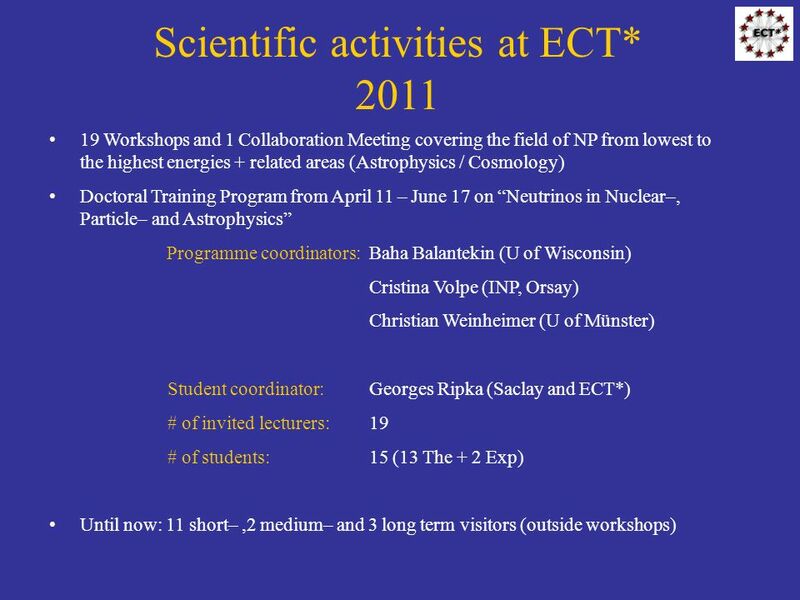 ROMANIA: Nuclear Physics. 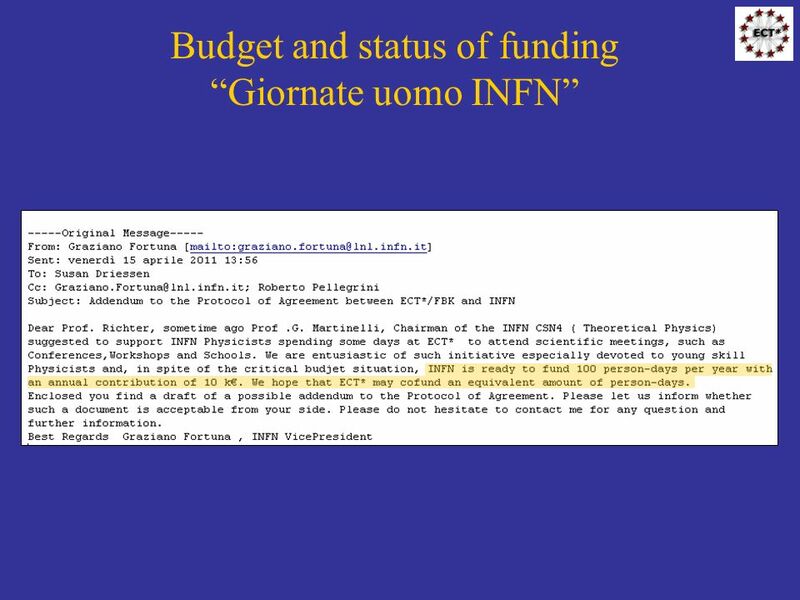 Goal 1: acquire a mutual and better understanding of the Funding systems of nuclear physics infrastructures and associated equipments in Europe that is. Cultural Heritage in REGional NETworks REGNET. 4. July 2002REV02 Luxembourg – Management Issues 2 Management Issues January 2002 – June 2002 Reporting. Current status of EHES Kari Kuulasmaa EHES meeting Luxembourg, 2 March 2011. Cross Country Comparison of Reforms The View of Top Executives in 11 European Countries Preliminary Results from the COCOPS Executive Survey Gerhard Hammerschmid. Using Leonardo da Vinci programme for training of specific experts in plastic sector EDMOULD - Improvement of Vocational Education in Field of Injection. Policy Research and Innovation Research and Innovation EUROSTARS JOINT PROGRAMME Research and Development programme undertaken by several Member States. 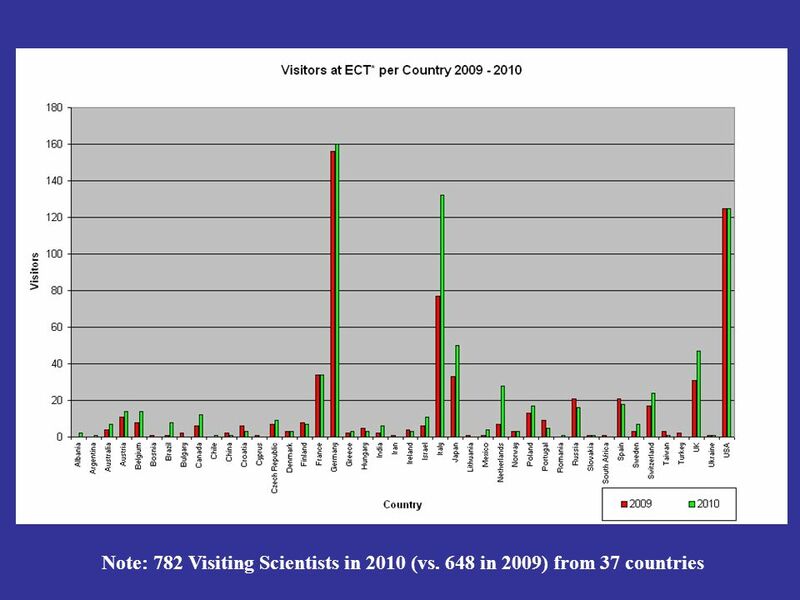 Participation of the Slovak Universities on the 7 FP by Prof. Daniel Kluvanec Constantine Philosopher University in Nitra Bratislava 6/12/2005.